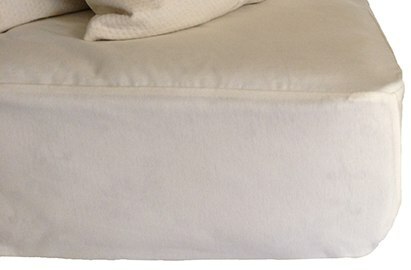 Protect your purchase of an organic mattress with an organic mattress protector. This protector features soft organic cotton knit and is backed with a waterproof membrane made from food-grade polyurethane. It also has an 8" pocket skirted with organic cotton jersey and is completely machine washable. Care instructions: Machine wash in cold water using a non-toxic detergent. Hang or tumble dry on low heat. No iron, high heat, fabric softener or bleach.